Not feeling so warm and fuzzy about requests for spec creative in a pitch? Sometimes agency execs are concerned that prospective clients might take their work and run with it while the agency doesn’t get paid. That may have happened in the past, but it doesn’t have to be that way. Today, options such as tighter contract terms, increased selectivity about which pitches you pursue, non-participation, and giving preference to consultant-led searches are all examples of ways to mitigate the financial risk of producing spec creative. 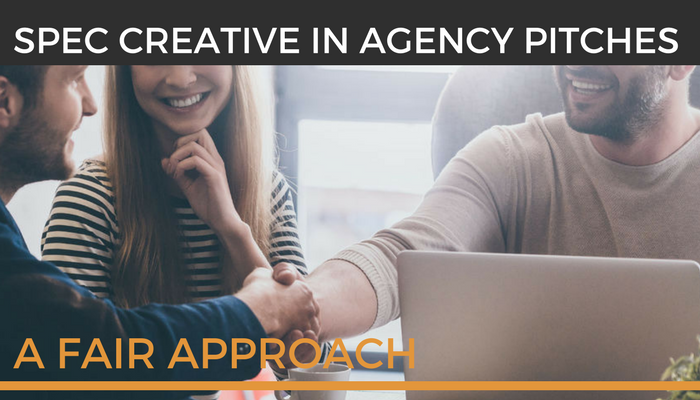 Agency search consultant Ken Robinson told us that he finds agencies are more inclined to provide spec creative in a consultant-led agency search process (as opposed to a client-led process) because they know they will have someone to advocate for them and their ownership rights. As a co-founder of Ark Advisors, the nation’s #1 ranked expert in helping marketers and procurement executives source agencies (creative, media, digital, direct, PR, SEM, etc. ), Ken has worked on all sides of the table — as agency CMO, as a marketing decision-maker on the client side, and now as an agency search consultant. This gives him a unique perspective on spec creative in agency pitches. In this post, we incorporate more of Ken’s valuable insights, this time about how spec creative can be approached in a way that is equitable for all parties. Meaningful conversations about paid and unpaid spec creative in a pitch must include transparency about actual agency costs. No one (agency or client) wants to be taken advantage of. The first step in preventing that is ensuring all parties accurately perceive agency costs to pitch. CubeYou interviewed 250 small to medium agencies with 50-100 employees and found they pitched an average of 10 new accounts in 2015. They also determined that the total cost for the final pitch varied greatly, but on average cost around $45,000, with creative and strategic planning representing over half of that figure (that number does not include CubeYou’s $15,000 estimated average cost to participate in an RFP, based on an average 100-150 hours of work). While a significant variance in pitching costs across agencies is to be expected, if these numbers are accurate, it means that small to medium agencies are paying over $450,000/year, on average, just to pitch. CubeYou’s data indicated a 52% churn rate in the agency sales funnel between RFP and final pitch. If this number is roughly accurate, and if getting to the pitch depends on the RFP, then getting to 10 pitches per year means an agency much complete 20 RFPs per year. Based on these figures, an agency could be paying around $300,000 per year on RFPs, plus $450,000 a year to pitch. Those are based on average figures, so let’s half that and double it for a ballpark range. That gives you a range of $375,000 to $1.5 million in yearly costs to pitch, including RFPs. So what’s the return on this pitching investment? CubeYou concluded that an agency must close 60% of their pitches to be profitable. That’s consistent with Mirren’s 2010 Client/Agency Relationship Study (they recommended agencies target a minimum of 10 pitches per year with a 60% close rate). But most agencies aren’t closing 60% of their pitches. CubeYou pegged the average agency close rate at 43%. In AdAge, Tom Martin estimated an average agency win-rate of 25%. Closing one in four pitches represents a huge financial drain for agencies that aren’t getting anything to offset their costs. Today, there are more agencies competing for the same business, it takes more time and resources to prepare a pitch (see IPA & ISBA research), pitch win-rates are down, and when you finally do land a new account, you’ll probably only have it for two to three years instead of the decade you may have kept a new account in the past. So, while the cost to pitch has jumped, the value of winning the account has declined. Conference & Incentive Travel surveyed 30 of the top 50 UK agencies in October 2015 and found the average cost of an event pitch is £10,000 ($12,764), with bigger agencies spending up to £750,000 ($957,300) on “particularly extravagant pitches.” Their respondents indicated the single biggest expense was manpower, with an average of 124 hours spent on pitch preparation. Other large expenses were technology, printed materials, and creative concepts. Peter Levitan, former Director of Business Development for Saatchi & Saatchi, wrote a blog for Hubspot in 2015 in which he also estimated the cost per RFP at $15,000, based on 150 hours of labor at $100 per hour. His “conservative estimate” of an average agency cost to pitch (including external and internal meetings, pitch management, strategic planning, writing, creative work, pitch design, travel and expenses, and post-presentation follow-up) is $35,000 per pitch. Ash Bendelow, managing director of creative agency Brave, in Marketing Week (Nov. 2016) estimated his average cost per pitch in 2016 was between £30,000 ($38,516) and £40,000 ($51,355). Research conducted in 2013 by The Institute of Practitioners in Advertising (IPA) and The Voice of British Advertisers (ISBA) found that agencies spent around £178K ($227,430) per pitch (approximately 99 working days), while clients perceived agency pitching costs to be closer to £31k ($39,608) for a large pitch. These numbers, some based on surveys and some based on anecdotal evidence, peg the range of costs for pitches between $12,764 and $957,300. The average of all these figures is $167,079 per pitch. Removing the highest and lowest figures (both extreme outliers and specific to a niche area), the average is $87,591 per pitch. Removing the next two highest figures (also relative outliers) in addition to the highest and lowest figure, the average is $45,550 per pitch, close to CubeYou’s average. (View the table we used here). Many people agree that the pitch process is flawed, but there is no consensus on how it should be fixed. One way to make it better is by paying agencies for pitches. Payments can take two forms (aside from whichever agency “wins” the account): stipends to offset the cost of pitching, and purchasing the spec creative presented in the pitch. Ken Robinson told us that it behooves the client company to pay a stipend to the finalist agencies they’ve asked to pitch them, as a goodwill gesture to help offset some of the agency’s costs related to the pitch. His firm, Ark Advisors, always recommends that clients pay this stipend. Ken points out that in client-led processes, agencies often are not paid to pitch simply because the client doesn’t know better; they don’t know what is fair and customary. This is one of the reasons why agencies prefer to participate in consultant-led pitches, he says. There is a difference, Ken explained, between a paid pitch that means payment to offset hard costs such as travel, research, etc., and a paid pitch which means, “we’re going to pay you X amount of dollars, and we’re going to own all the ideas you present to us.” The former is very flexible, and in some cases, nominal (likely in the low five figures). The latter type is typically much more costly (likely in the low six figures). This is a critical distinction. Ken’s firm takes the position that works not purchased by the client can’t be used. Only once in the history of Ark Advisors’ searches have they ever had a client who wanted to own all of the ideas presented in the course of the pitch. In that case, each of the three finalist agencies was paid for their work, and the client ultimately owned all of the work that was pitched. The agencies all knew this going in. The finalists ended up being paid over $300,000 each in exchange for ownership of the work presented in their pitches. Ark Advisors arrived at that figure by speaking with the agencies and asking them what they thought would be a fair number, and what would make them feel compelled to participate so that if they didn’t win the business, they would still feel like they were fairly compensated. You might ask why a client would want to pay $900K just to consider pitches? Ken says one of the main reasons is this: often by the time agencies get to the final presentations, the results are very, very similar between agencies. His firm has even seen the exact same tagline presented by two different agencies in the course of a pitch. The reason is that they’ve all received the same research, the same information, and the same directives from the client. So, he says, it’s not that unusual. Ken goes on to explain that there have been cases in the industry where an agency has sued a client, saying they pitched an idea to the client, they didn’t win, and then the client used the idea anyway. It may be that the client went with another agency that had the same concept, so maybe the client did buy the idea, but not all instances of the idea that was presented. Of course, it takes a while to sort that all out. That’s why procurement or the legal department will sometimes determine that they need to own all of the work presented to avoid any expensive litigation. Ken points out that, “In many cases, spec creative is a fair and necessary ask for a client to make a hiring decision with confidence. This demonstrates that agencies are equally as proficient in strategic planning as they are in creative ideation (which, surprisingly, is not always the case). And, strategic ideas are often better understood by clients when they are dimensionalized through creative expression.” The takeaway, though, is that paying a stipend to the agency finalists when spec creative is part of a pitch should also be recognized as fair and necessary. Obviously, not all agency search processes are consultant-led, and unpaid spec work in pitches remains common. A 2007 survey by the American Association of Advertising Agencies suggested that less than half of major advertisers offered stipends to cover some part of agencies’ pitching costs. Another survey by Worldwide Partners in 2009 indicated European agencies were receiving compensation for pitches much more frequently than North American agencies (56% vs. 5%). Some agency insiders (like Infectious Media’s Peter Hanford and Ash Bendelow of Brave) have spoken up to say (and I’m broadly paraphrasing) that they care less about being paid to pitch than having a well-run and fair pitch process that is respectful of the work agencies are investing. That might include feedback, transparency, clear requirements, limiting the finalists to only those clients are genuinely interested in working with, narrowing finalists to three agencies instead of eight, being timely, organized, and sticking to a clear outcome. Here’s to hoping things continue to evolve towards a more sustainable and equitable solution for all parties. Until then, you always have the option of rejecting free spec creative. It’s a bold move that may not work for every agency, but Zulu Alpha Kilo’s Zak Mroueh wrote in AdWeek a couple of years ago about how it’s worked for his agency (and explained why he thinks free spec creative is ultimately bad for clients as well as agencies). The post (and accompanying video) continue to generate conversation on their site and social media with the hashtag #saynotospec. Have some thoughts on a fair approach to spec creative for agency pitches? We welcome your comments.